I had to read this in high school in my theatre class. After my senior year I donated it to the school. I didn't realize I would still need this as an reference after high school so I bought it again. 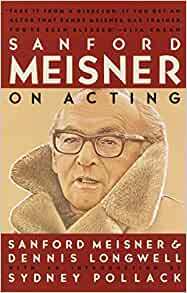 If Meisner were teaching today, his bullying tactics and cult-like persona would put him out of business. Nobody would put up with that crap. I remember liking aspects of the Meisner technique, so I'm re-reading this book. He's so horrible to his students, it's painful to read. Today, this book reads more like a biography of an megalomaniacal ogre than an acting primer. I read this to get a better understanding of Meisners technique and hope to learn something new. It wasn't my style at all. Though there are some gems here I took to heart about preparing, listening and emotion. This is not a very encouraging book and he seemed very arrogant. I read the entire book. Meisner is funny as hell. He is real and is not afraid of being transparent with the students he taught. My favorite lessons was using the imaginary "as if" which helps a whole lot and the repetition exercise which gets you out of your head and into "living under imaginary circumstances". It gets you to react to the other person which is vital if you want to make a scene in a movie or play seem legit. If you read this book, and you should, use a high-lighter and take some notes. Loved it! Sanford Meisner is one of the greats in the acting field. He shows his ability to teach and inspire. This book is also very well-written and understandable, even to the novice actor. Thank you Sanford, for thinking about your fellow actors enough to help them along their way.